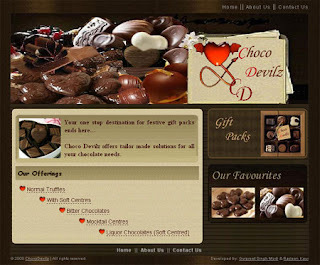 Recently, I (along with Rasleen) developed a website for a friend who has started his own chocolate brand, Choco Devilz. Being a website for promoting a brand of chocolates, it had to have a look and feel for arousing the gourmets. The task was a bit challenging for me as I had never developed a promotional website. We started making a few layout plans on paint, looked for ideas on the web and after long brainstorming sessions settled on the plan of a template which we would be designing. We developed the site structure and wrote the CSS for it. The banner and the graphics were designed next. It was fractious to work with curved blocks both while designing and coding. But, the effect they produce is worth the effort. If you wish to give a feedback about ChocoDevilz.com, do leave a comment on this post. hey the color combo is really great.. will give u detailed feedback on phone!